Malaria is still taking the lead as one of the deadliest infectious diseases worldwide, appealing continuous research for further understanding the biology and the pathogenesis of this fascinating parasite. Discovering effective alternative drugs, however, remains a challenging task to address today’s enigmatic problem, the emergence of resistant strains. Factually, the presence of potent natural products considered as a basis for traditional medicine. Ziziphus spina-christi (L.) is a common plant in gulf region and other nations, as a part of their traditional medicine. The aim of this study was to evaluate the antiplasmodium and the antioxidant activity of Z. spina-christi leaf extracts (ZLE) against Plasmodium berghei induced liver and spleen injury. The study involved three groups; a vehicle control group, infected with 106 P. berghei-parasitized erythrocytes group and ZLE treated-infected mice with 106 P. berghei-parasitized erythrocytes group. The histopathological examination of the liver and spleen showed sever histological changes. Animals treated with ZLE showed a significant improvement in the histological picture of liver and spleen. Biochemical analysis revealed that treatment with ZLE resulted in a significant reinstating of the oxidative markers back to normal level. It could be concluded that ZLE have a power protective role against Plasmodium infection. Malaria, Ziziphus spina-christi, Liver, Spleen, Histology, Oxidative markers, Mice. Ground breaking strategies have been made in the fight against the entirely preventable and treatable disease, malaria. However, malaria still remains one of the deadliest infectious diseases today, causing annually high mortality rate . The malarious patient is manifested by having recurrent febrile episodes which are due to asexual cycle of Plasmodiuminfected red blood cell. Once infectious sporozoite enters the bloodstream, it homes in liver where the clinically silent preerythrocytic stages of Plasmodium life cycle take place. In liver, each invading sporozoite differentiates and divides mitotically resulting in the release of thousands of liver merozoites that invade erythrocytes . During malaria, spleen is known to have central role in clearance of malaria parasite, production of new red blood cells and inducing of immunity . Studies of malaria pathogenesis revealed a dramatic, albeit variable hepatic and splenic response of which spleen pathology is mostly characterized by splenomegaly. In point of fact, the intensity of malaria transmission in endemic regions usually had been determined through the size of spleen [4-6]. On the other hand, liver pathology usually varies from slight variations in liver function tests to severe liver failure [7,8]. Regarding controlling malaria, vector control, effective vaccination and potent antimalarial drug considered the power of integrated action. Vector control applied to reduce malaria transmission  whereas malaria vaccine such as RTS’S (also known as MosquirixTM) aims toward malaria eradication which is currently in clinical phase III trials and safety trial . Regarding antimalarial drugs, malaria treatments have been complicated with the development of resistance against artemisin in-based combination therapies as well as the previous first-line therapies . Nature has been bestowed with an enormous wealth of medicinal plants. Thus, exploring variety of natural origin sources for bioactive compounds became the area of high interest. Zizyphus spina-cristi (L.) Willd. (ZSC) belongs to family Rhamnaceae, common names Sidr in Arabic and Christ’s thorn or Jerusalem-thorn in English. ZSC is widely used in traditional medicine across gulf region and other nations in the management of pain and inflammatory related problems [12,13]. ZSC also knows to exhibit effective antioxidant, hepatoprotective, antimicrobial and antiinflammatory properties [14-16]. Moreover, antidiabetic and antihyperglycaemic effects have been related to ZSC [17,18]. Interestingly, Adzu et al. showed that the Z. spina-christi has an antiplasmodial activity against rodent parasite Plasmodium berghei berghei . The fact that Plasmodium berghei, rodent malaria parasite, shared many of the pathological and immunological features with the human malaria parasite, P. falciparum, makes it an appropriate model to study the role of liver and spleen during malaria infection [20,21]. Therefore, the present study aims to examine the potential role of Z. spina-christi leaf extracts on murine malaria parasite induced hepatic and spleen tissue damage. According to Abdel Moneim , Ziziphus spina-christi leaf extracts (ZLE) was prepared with slight modifications. Air dried powder (100 g) of ZLE was extracted using percolation with 70% methanol at room temperature and reserved at 4°C for 24 h. Concentration of the obtained extract was carried out under reduced pressure (bath temperature 50°C) before being dried in a vacuum evaporator. For experimental use, the residue was dissolved using distilled water. Adult C57BL/6 male mice were obtained from the animal house facility at King Faisal Hospital, Riyadh. Upon strict accordance with the institutional and national official guideline for the project number NFG-15-02-07, animals were maintained in a specific pathogen-free condition at the department of Zoology animal housing facilities. P. berghei was passaged in Swiss albino mice and as soon as parasitemia reached 20%, parasitized blood was used to infect mice. An intraperitonial injection of 1 × 106 P berghei-infected erythrocytes was inoculated to the disignated groups of mice. Blood smears were stained with Giemsa stain and parasitemia were calculated. Neubauer chamber was also used to estimate the cell number per ml. Three groups were allocated as follows; a vehicle control group, infected with 106 P. berghei-parasitized erythrocytes group and ZLE treated-infected mice with 106 P. bergheiparasitized erythrocytes group. The last group was gavage with 100 μl of 300 mg/kg ZLE for 9 days . Scarification of all mice was conducted at day 9 post-infection (p.i.). Liver and spleen were aseptically extracted and fixed in neutral buffered formalin. Following fixation, specimens were dehydrated, embedded in wax, and then sectioned to 5 microns thickness. For histological inspections, haematoxylin and eosin stains were used to stain the sections. Regarding liver examination, the extent of histological changes was scored according to Jamshidzadeh et al. as follows: 0: absent;+: mild;++; moderate; and +++: severe. According to a modified quantitative Ishak scoring system, the liver activity index was estimated as the following; scores of 1-3 were assigned to cases of minimal liver damage, scores of 4-8: mild, scores of 9-12: moderate, and scores of 13-18: severe . For the spleen, a semi-quantitative scoring system was used . Segments of spleen were scored for the enlargement of B- and T-lymphocyte areas in red and white pulps (0, absent; 1, slight; 2, moderate; and 3, pronounced) and for the increased number of apoptotic cells, macrophages, necrotic cells and presence of pigments (0, absent; and 1, present). Scoring of each tissue sample represented the mean score of five different high microscopic power fields. Homogenization of known weights of liver and spleen tissues was carried out in phosphate buffer. Using Ellman's reagent, Glutathione (GSH) level was determined in both homogenates  whereas the nitric oxide (NO) level was measured following Berkels et al. method . Moreover, according to the method of Ohkawa et al. , lipid peroxidation level in homogenates was recorded. A statistical package program (SPSS version 17.0) was used to perform one-way ANOVA and statistical comparisons between the groups with Duncan’s test. P ≤ 0.05 was considered as significant for all the statistical analyses. Initially, the effect of ZLE against Plasmodium berghei induced hepatic injury was observed through parasitemia level. Significantly, reduction of the parasitemia level in ZLE treated infected mice was recorded in comparison with that of untreated infected group (data not shown). This effect may points out the possible antimalarial activity of ZLE. Regarding the histopathological results, liver sections of mice infected with P. berghei infected erythrocytes revealed inflammatory cell infiltration of which prominent van Kupffer cells and hepatocyte vacuolation were observed (Figures 1A and B). 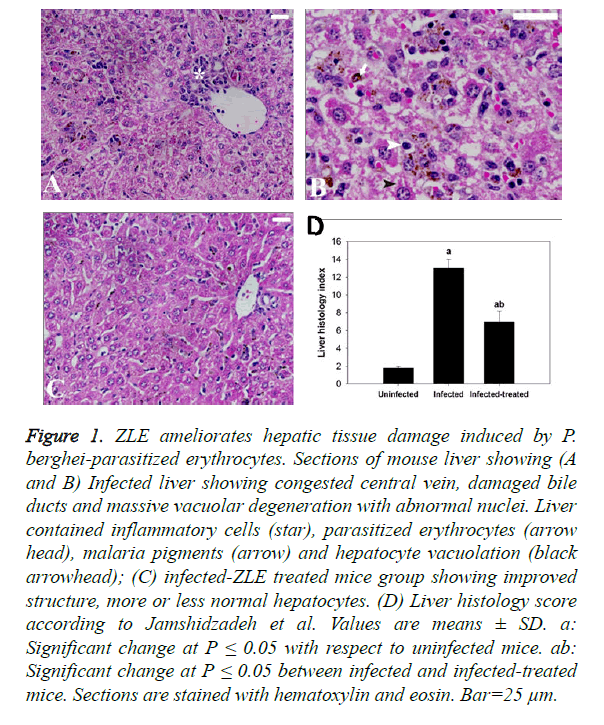 ZLE was able to significantly improve and preserve the hepatocellular structure (Figure 1C) as well as revealing significant changes in the total histological injury scores in liver of infected mice with P. berghei (Figure 1D). With regards to the spleen histopathological result, changes to the spleen following malaria infection include splenomegaly and hyperplasia of the white pulp regions which also shows prominent migration of macrophages and lymphocyte destruction. Moreover, the red pulp of splenic tissues infected with P. berghei showed significant congestion of both red blood cells (RBCs) and packed RBCs (pRBCs) (Figure 2A). Remarkably, the remedy effect of ZLE was further observed in infected treated splenic tissues that revealed noprominent migration of macrophages in the white pulp nor intensive RBCs congestion in the red pulp (Figure 2B). All of these observations are supported by the splenic histology index that revealed a significant change in the Infected-ZLE treated mice group in comparison with that of infected mice group (Figure 2C). Figure 1. ZLE ameliorates hepatic tissue damage induced by P. berghei-parasitized erythrocytes. Sections of mouse liver showing (A and B) Infected liver showing congested central vein, damaged bile ducts and massive vacuolar degeneration with abnormal nuclei. Liver contained inflammatory cells (star), parasitized erythrocytes (arrow head), malaria pigments (arrow) and hepatocyte vacuolation (black arrowhead); (C) infected-ZLE treated mice group showing improved structure, more or less normal hepatocytes. (D) Liver histology score according to Jamshidzadeh et al. Values are means ± SD. a: Significant change at P ≤ 0.05 with respect to uninfected mice. ab: Significant change at P ≤ 0.05 between infected and infected-treated mice. Sections are stained with hematoxylin and eosin. Bar=25 μm. Figure 2. ZLE improves splenic tissue damage induced by P. bergheiparasitized erythrocytes. (A), the infected mice spleen with P. berghei, on day 9, show prominent migration of macrophages in white pulp region and RBCs congestion in the red pulp region (arrow head). (B), Infected-ZLE treated mice group display improved architecture. (C), Spleen histology scores according to Giamarellos-Bourbouliset al. Values are means ± SD. a: Significant change at P ≤ 0.05 with respect to uninfected mice. ab: Significant change at P ≤ 0.05 between infected and infected-treated mice. Sections are stained with hematoxylin and eosin. Bar= 25 μm. WP, white pulp. RP, red pulp. With respect to the liver oxidative damage in mice infected with P. berghei, the levels of the hepatic oxidative markers, glutathione, nitric oxide and malondialdehyde (MDA) were significantly (P ≤ 0.05) altered. Significantly, the hepatic glutathione, NO and MDA were remarkably improved in ZLE treated mice (Table 1). These results are reinforced by representing the spleen oxidative damage upon infection where thelevels of the splenic oxidative markers were significantly (P ≤ 0.05) changed. Similarly, ZLE successfully improved the level of splenic oxidative markers back to normal levels (Table 2). Values are means ± SD (n=6). aSignificant change at p<0.05 with respect to uninfected mice. abSignificant change at p < 0.05 with respect infected mice. Table 1. Effect of Z. spina-christi leaf extracts on mice liver glutathione, nitric oxide and malondialdehyde level in mice infected with P. berghei at day 9.
abSignificant change at p<0.05 with respect infected mice. Table 2. Effect of Z. spina-christi leaf extracts on mice spleen glutathione, nitric oxide and malondialdehyde level in mice infected with P. berghei at day 9. The growing resistance to current malaria drugs advocated for applying different tactics to eliminate malaria. One of these tactics is the exploring traditionally used herbal medicines for a mission of finding an alternative antimalarial drug. Zizyphus spina-christi plant is commonly used in Egyptian folk medicine for the treatment of different diseases. Z.spinachristi, in other cultures, is known as a blood purifier and as a therapy for epilepsy, dermatitis and hepatic diseases . Z. spina-christi was used in the present study to evaluate its potential role on P. berghei induced hepatic and splenic inflammation. In malaria, parasitemia usually corresponded with weight change of the infected host. Expectedly, the significant fall of the body weight percentage of infected mice (data not published) was corresponding with the parasitemia level. Parasitemia level was high in the infected group whereas in the infected-ZLE treated mice group, the level was significantly reduced. This was in a line with Mishra and Bhatia study  that showed the effectiveness of Ziziphus mauritiana in reducing the parasitemia level in Swiss albino mice upon Plasmodium berghei berghei induced infection. Essentially, these observations were reinforced by the remarkable remedy effects of ZLE on the histological appearance of both infected liver and spleen tissues. Generally, malaria-associated hepatocellular dysfunction has been recorded in variable degrees that ranges from elevated liver enzymes, jaundice, hepatomegaly to altered histopathological findings and liver failure [7,8]. Expectedly, the liver of infected mice with P. berghei in this study showed signs of inflammatory cell infiltration and hepatocyte vacuolation which has been suggestively ameliorated upon ZLE treatment. Likewise, a study conducted by Amin and Mahmoud-Ghoneim  reported the effectiveness of Z. spina-christi in treating and preventing hepatic fibrosis caused by carbon tetrachloride. These data generally indicate the ability of ZLE to reserve the hepatocellular membrane integrity and the hepatic architecture. Concurrently, architectural changes that accompany malaria infection to splenic tissue have been recorded in this study. Significantly, hyperplasia of the white pulp regions and migration of macrophages have been observed beside significant congestion of both RBCs and pRBCs in the red pulp of splenic tissues infected with P. berghei. These data are in agreement with previous studies that showed striking changes in splenic cell distribution flowing P. chabaudi chabaudi infection [32,33]. Once more, the effectiveness of ZLE in diminishing the malaria-associated splenic dysfunction has been standing out in this study. ZLE was able to reinstate the splenic architecture back to uninfected control state. A study by Ali and Hamed presented the pronounced improving activity of Z. spina-christi extracts in the histopathological picture of liver, kidney and spleen which were affected by Schistosoma infection . With regards to the antioxidant effects of Z. spina-christi extracts, as known that most of the malaria pathogenesis is mounted by the body immune system [35,36], hepatic and splenic inflammation is also occurred as a consequence of an excessive host inflammatory response to the causative pathogen and the imbalance of pro-and anti-inflammatory mediators [3,37]. Importantly, the oxidative markers, glutathione, nitric oxide (NO) and malondialdehyde (MDA), were increased significantly upon P. berghei induced hepatic and splenic inflammation. In this study, ZLE showed a protective effect of hepatic and splenic tissues through reinstatement the normal levels of the oxidative markers and impeding the progression of hepatic and splenic fibrosis. This was in line with Yossef et al’s study who reported similar findings of ZLE protective effect in mice intoxicated with carbon tetrachloride (CCl4) . Furthermore, El-Rigal et al. stated the ability of ZLE in amelioration the hepatic disorders through restoring the normal levels of MDA in Schistosoma mansoni infected mice . To conclude, although at this initial stage the exact mode of action of Z. spina-christi extract has not been explained, the present study has shown that methanolic leaf extract of Z. spina-christi possess antiplasmodial activity. This observed antiplasmodial activity may be referred to the presence of butic acid and ceanothic acid (a ring-A homologue of betulinic acid) . Further investigations are needed to identify the active constituents and the mode of action responsible for antiplasmodial activity of Z. spina-christi. The authors appreciate the Deanship of Scientific Research at King Saud University for funding this work through the Research Project No., NFG-15-02-07. WHO. World Health Organization, World malaria report: Geneva: World Health Organization 2012. Cowman AF, Crabb BS. Invasion of red blood cells by malaria parasites. Cell 2006; 124: 755-766. EngwerdaCR, BeattieL,Amante FH. The importance of the spleen in malaria. Trends in Parasitology 2005; 21: 75-80. Neva FA, Sheagren JN, Shulman NR, Canfield CJ. Malaria - Host-Defense Mechanisms and Complications. Annals of Internal Medicine 1970; 73: 295. Fernando Chaves L, Taleo G, KalkoaM Kaneko A. Spleen rates in children: an old and new surveillance tool for malaria elimination initiatives in island settings. Transactions of the Royal Society of Tropical Medicine and Hygiene 2011; 105: 226-231. Ferrer M, Martin-JaularL, De Niz M, Khan SM, Janse CJ, Calvo M, Heussler V, del Portillo HA (2014) Imaging of the spleen in malaria. Parasitology International 63: 195-205. Whitten R, Milner DA, JrYeh MM, Kamiza S, Molyneux ME, Taylor TE. Liver pathology in Malawian children with fatal encephalopathy. Human Pathology 2011; 42: 1230-1239. Anand AC, Puri P. Jaundice in malaria. Journal of Gastroenterology and Hepatology 2005; 20: 1322-1332. Benelli G. Plant-borne ovicides in the fight against mosquito vectors of medical and veterinary importance: a systematic review. Parasitology Research 2015; 114: 3201-3212. Mian-McCarthy S, Agnandji ST, Lell B, Fernandes JF, Abossolo BP, Methogo BGNO, KabwendeAL, Adegnika AA, Mordmueller B. A Phase 3 Trial of RTS,S/AS01 Malaria Vaccine in African Infants. New England Journal of Medicine 2012; 367: 2284-2295. KumarS, Kumari R, PandeyR. New insight-guided approaches to detect, cure, prevent and eliminate malaria, Protoplasma 2014; 1-37. Adzu B, Amos S, Wambebe C, Gamaniel K. Antinociceptive activity of Zizyphusspina-christi root bark extract. Fitoterapia 2001; 72: 344-350. Alhakmani F, Khan SA, Ahmad A. Determination of total phenol, in-vitro antioxidant and anti-inflammatory activity of seeds and fruits of Zizyphusspina-christi grown in Oman. Asian Pacific Journal of Tropical Biomedicine 2014; 4: S656-S660. Mohammed GT, Abdulrahman FI, Khan IZ, Hussaini MI, Muazu J, Si Y, Wazis CH. Antimicrobial efficacies of ethanolic extract and active column fractions of the stem-bark of Zizyphusspina-christi L. International Journal of Pharmacy and Pharmaceutical Sciences 2013; 5: 455-460. Singh V, Guizani N, Essa MM, Rahman MS, Selvaraju S. In vitro antioxidant activities of Ziziphusspina-christi Fruits (red date) grown in Oman. Biotechnology 2012; 11: 209-216. Abalaka ME, DaniyanSY, Mann A. Evaluation of the antimicrobial activities of two Ziziphus species (Ziziphusmauritiana L. and Ziziphusspinachristi L.) on some microbial pathogens, African Journal of Pharmacy and Pharmacology 2010; 4: 135-139. Abdel-ZaherAO, Salim SY, Assaf MH, Abdel-Hady RH. Antidiabetic activity and toxicity of Zizyphusspina-christi leaves. Journal of Ethnopharmacology 2005; 101: 129-138. Glombitza KW, Mahran GH, Mirhom YW, Michel KG, Motawi TK.Hypoglycemic And Antihyperglycemic Effects Of Zizyphus-Spina-Christi In Rats. PlantaMedica 1994; 60: 244-247. Bulus A, KaitaHA, AdeolaSO, Adam KU, Anoka N. In vivo antiplasmodial activity of ZS-2A: a fraction from chloroform extract of Zizyphusspina-christi root bark against Plasmodium bergheiberghei in mice. International Journal of Biological and Chemical Sciences 2007; 1: 281-286. Hall N, Karras M, Raine JD, Carlton JM, Kooij TWA, Berriman M, Florens L, Janssen CS, Pain A, Christophides GK, James K, Rutherford K, Harris B, Harris D, Churcher C, Quail MA, Ormond D, Doggett J, Trueman HE, Mendoza J, Bidwell SL Rajandream MA, Carucci DJ, Yates JR, Kafatos FC, Janse CJ, Barrell B, Turner CMR, Waters AP, Sinden RE. A comprehensive survey of the Plasmodium life cycle by genomic, transcriptomic, and proteomic analyses. Science 2005; 307: pp. 82-86. Oppenheim RD, Creek DJ, Macrae JI, Modrzynska KK, Pino P, Limenitakis J, Polonais V, Seeber F, Barrett MP, Billker O, McConville MJ, Soldati-Favre D. BCKDH: The Missing Link in Apicomplexan Mitochondrial Metabolism Is Required for Full Virulence of Toxoplasma gondii and Plasmodium berghei. Plos Pathogens 2014; 10: 18. Abdel Moneim AE. Evaluating the potential role of pomegranate peel in aluminum-induced oxidative stress and histopathological alterations in brain of female rats. Biological trace element research 2012; 150: 328-336. Alzahrani F, Al-Shaebi EM, Dkhil M, Al-Quraishy S. In vivo Anti-Eimeria and in vitro Anthelmintic Activity of Ziziphusspina-christi Leaves Extract.2016. Jamshidzadeh A, Baghban M, Azarpira N, Bardbori AM,Niknahad H. Effects of tomato extract on oxidative stress induced toxicity in different organs of rats. Food ChemToxicol 2008; 46, 3612-3615. Ishak K, Baptista A, Bianchi L, Callea F, Degroote J, Gudat F, Denk H, Desmet V, Korb G, Macsween RNM, Phillips MJ, Portmann BG, Poulsen H, Scheuer PJ,Schmid M,Thaler H. Histological grading and staging of chronic hepatitis. J Hepatol 1995; 22: 696-699. Giamarellos-Bourboulis EJ, Tziortzioti V, Koutoukas P, Baziaka F, Raftogiannis M, Antonopoulou A, Adamis T, Sabracos L, Giamarellou H. Clarithromycin is an effective immunomodulator in experimental pyelonephritis caused by panresistantKlebsiella pneumonia. J AntimicrobChemother 2006; 57: 937-944. Ellman GL. TISSUE SULFHYDRYL GROUPS. Archives of Biochemistry and Biophysics 1959; 82: pp.70-77. Berkels R, Purol-Schnabel S,Roesen R. Measurement of nitric oxide by reconversion of nitrate/nitrite to NO. Methods in molecular biology (Clifton, N.J.) 2004; 279: pp. 1-8. Ohkawa H, Ohishi N,Yagi K. ASSAY FOR LIPID PEROXIDES IN ANIMAL-TISSUES BY THIOBARBITURIC ACID REACTION. Analytical Biochemistry 1979; 95: pp.351-358. Mishra Tulika, Bhatia Aruna.Antiplasmodial effects of the aqueous ethanolic seed extract of Ziziphusmauritiana against Plasmodium berghei in Swiss albino mice. International Journal of Pharmacological Research2014;4. Amin, A, Mahmoud-Ghoneim, D. 'Zizyphusspina-christi protects against carbon tetrachloride-induced liver fibrosis in rats. Food and Chemical Toxicology2009; 47: pp. 2111-2119. Helmby H, Jonsson G, Troye-Blomberg M. Cellular changes and apoptosis in the spleens and peripheral blood of mice infected with blood-stage Plasmodium chabaudichabaudi AS. Infection and Immunity 2000; 68: pp.1485-1490. Achtman AH, Khan M, MacLennan ICM, Langhorne J. Plasmodium chabaudichabaudi infection in mice induces strong B cell responses and striking but temporary changes in splenic cell distribution. Journal of Immunology 2003; 171: pp.317-324. Ali SA, Hamed MA. Effect of Ailanthus altissima and Zizyphusspina-christi on Bilharzial Infestation in Mice: Histological and Histopathological Studies. Journal of Applied Sciences 6:1437-1446. Lamb TJ, Brown DE, Potocnik AJ,Langhorne J. Insights into the immunopathogenesis of malaria using mouse models. Expert reviews in molecular medicine 2006; 8: pp.1-22. Langhorne J, Ndungu FM, Sponaas A.-M, Marsh K. Immunity to malaria: more questions than answers. Nature Immunology 2008; 9:pp. 725-732. Deroost K, Lays N, Thao-Thy P, Baci D, Van den Eynde K, Komuta M, Prato M, Roskams T, Schwarzer E, Opdenakker G, Van den Steen PE. Hemozoin Induces Hepatic Inflammation in Mice and Is Differentially Associated with Liver Pathology Depending on the Plasmodium Strain 2014; Plos One 9(11). Yossef HE, Khedr AA, Mahran MZ. Hepatoprotective and antioxidant effects of Zizyphusspina-christi fruits on carbon tetrachloride induced hepatotoxicity in rats. Nature and Science 2011;9:1-7. Saba El-Rigal N, Aly SA, RizkM, Said A. Use of Ailanthus altissima and Ziziphusspinachristi Extracts As Folk Medicine for Treatment of Some Hepatic Disorders In Schistosomamansoni Infected Mice. Trends in Medical Research 2006; 1: 100-112.